Atacak! 1655 Swedish troops invaded Poland to get the Polish crown. 1 Atacak! 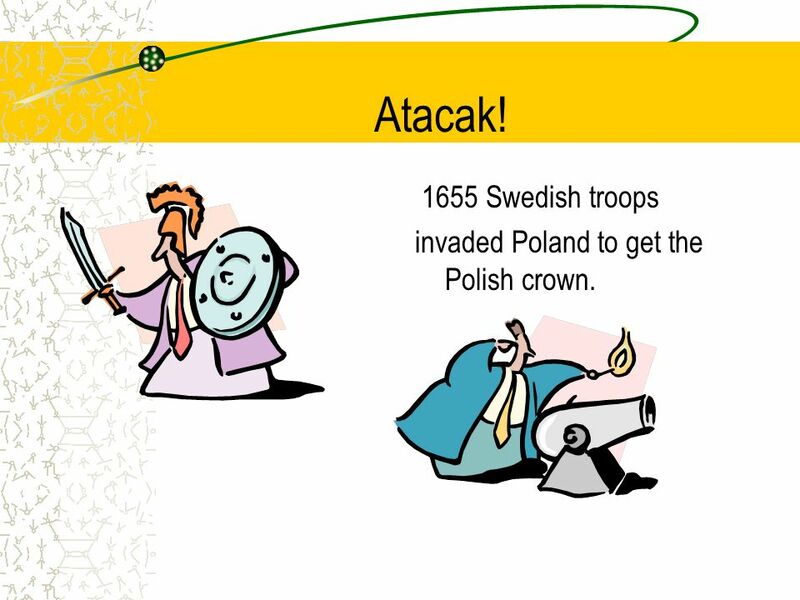 1655 Swedish troops invaded Poland to get the Polish crown. 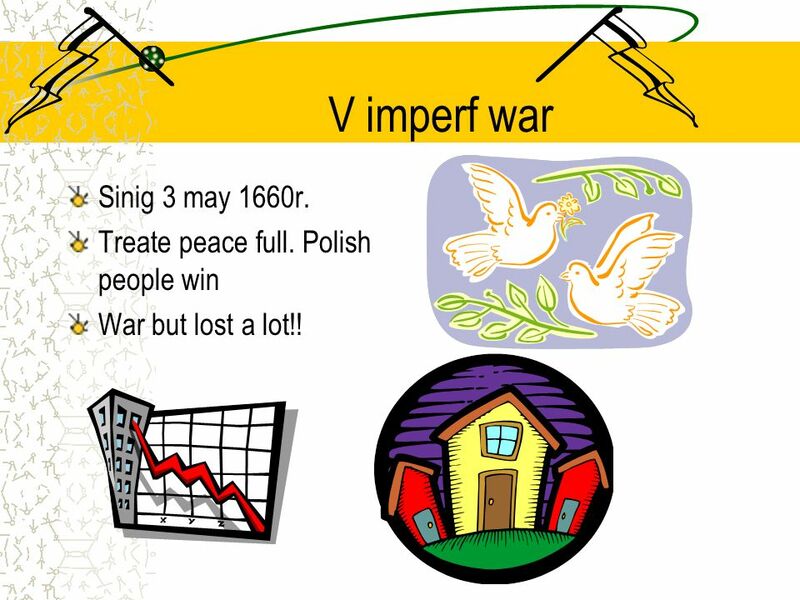 2 V imperf war Sinig 3 may 1660r. Treate peace full. Polish people win War but lost a lot!! 3 Mazovia betiful The flat landscape of Mazovia Province, varied by the Vistula, Bug, Narew, Pilica and Bzura river beds, with the following forests: Biała, Bolimowska, Iłżecka, Kamieniecka, Kampinoska, Kozienicka and Zielona, abounding in lakes - favors various forms of tourism. 4 The legend of Wars and Sawa Long long time ago there was a litle cottage on the visual river. In this cottage at the Vistula river. 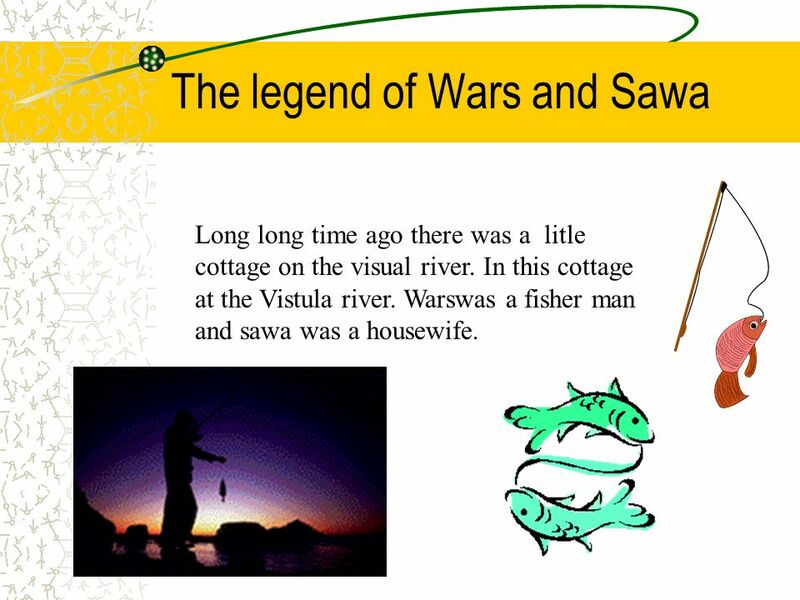 Warswas a fisher man and sawa was a housewife. 5 Hunting!! 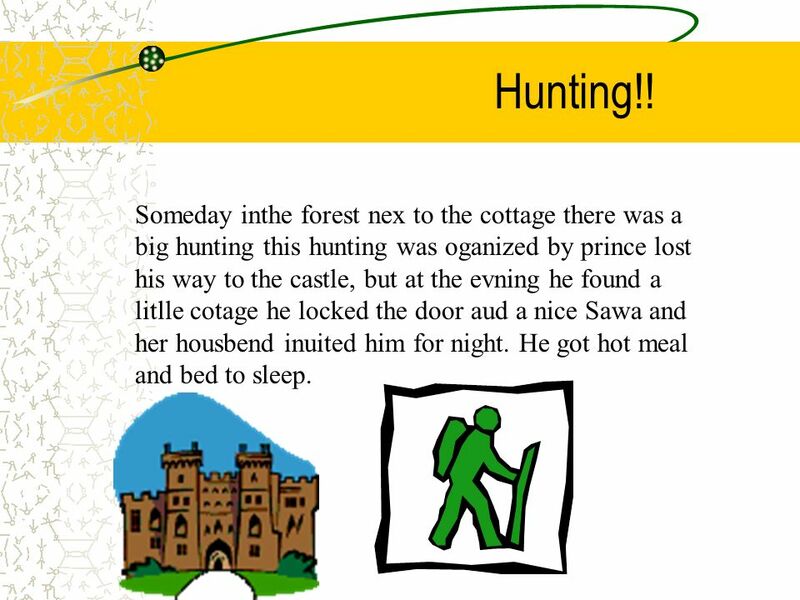 Someday inthe forest nex to the cottage there was a big hunting this hunting was oganized by prince lost his way to the castle, but at the evning he found a litlle cotage he locked the door aud a nice Sawa and her housbend inuited him for night. He got hot meal and bed to sleep. 8 MAZOVIA Mazovia is a beautiful region. 3.573 people live there. 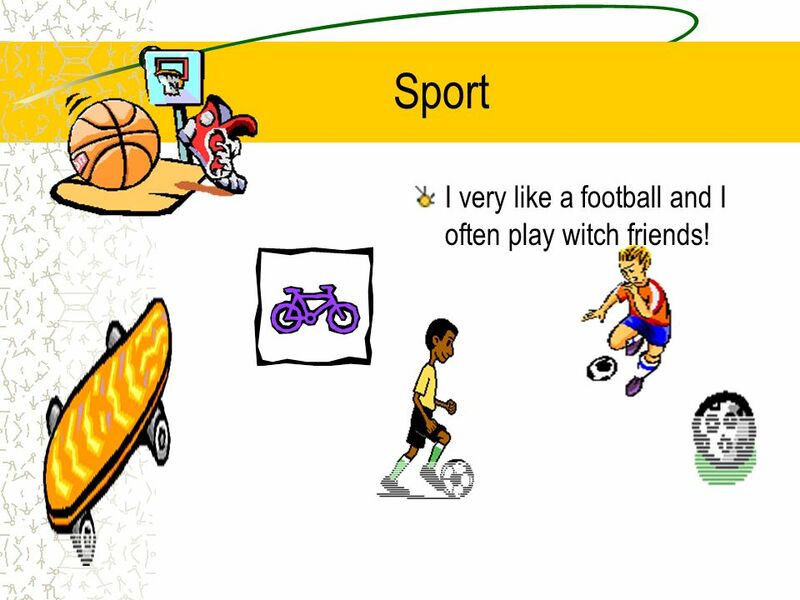 10 Sport I very like a football and I often play witch friends! 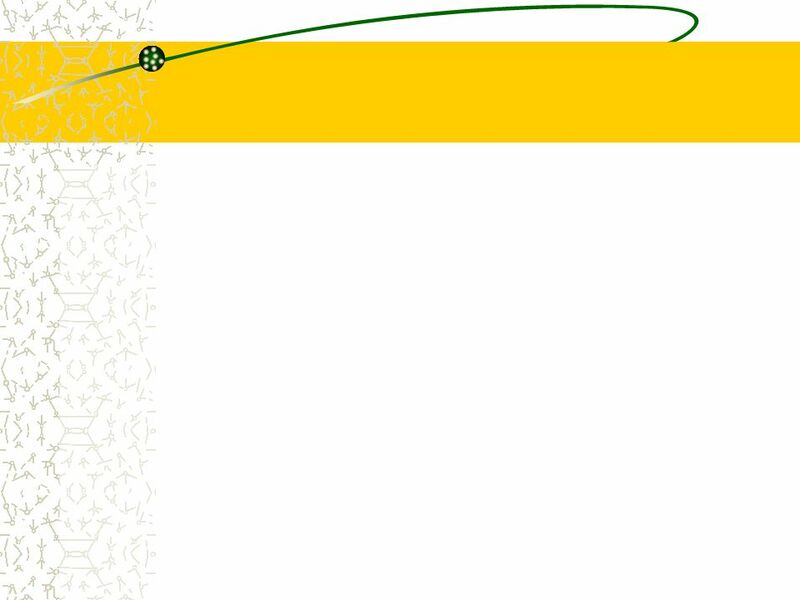 Download ppt "Atacak! 1655 Swedish troops invaded Poland to get the Polish crown." Geografia Mazowsza By Artur Ambroziak. 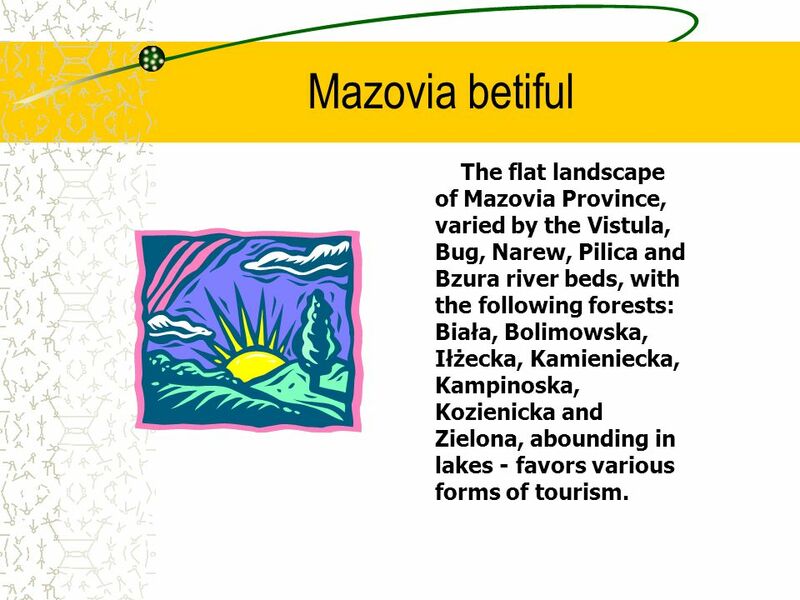 Geography Mazovia Landscape Important cities. Important rivers. Important lakes. Mazovia. Map of Mazovia Here is Mazovia Location Mazovia covers an area of 35,597 square kilometers and is the largest administrative region of the country. Marcin Jaskulski My name is Marcin Jaskulski. I am 13 years old and I am a male. I live in Radziejowice in a house with a big garden, with my mother, father. A D V E R B S of C O N T R A S T “Despite, in spite of, although, whereas, however, yet” K A R Ş I T L I K gösteren ZARFLAR. 1. 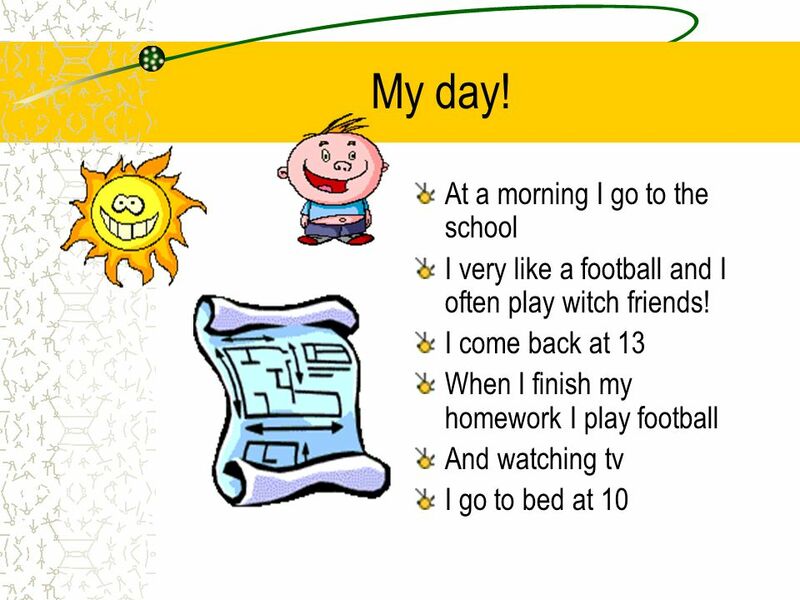 Fill in the blanks with the correct form of the given words. leave hear plan ask hope 1. I ____________ that Thailand is a good place to go sightseeing. Little boy, little trouble 小小少年,很少烦恼 look around, the sun shines 眼望四周阳光照 little boy, little trouble 小小少年,很少烦恼 only hope like so forever 但愿永远这样好 year by. POLISH NATIONAL LEGEND ABOUT WARS AND SAWA 2ak class, Raseiniai Victoras Petkus basic school, Lithuania. Unit 4 My home 湖北省宜昌市点军区点军小学 樊小华. Look at Tim! What would he like people to do? What would he like people not to do? 1.Give 4 details about how Raul is described. 4 2.How is he? 1 3.How old is he (at that moment)? 1 4.How does he describe his team? 3 5.Does he get on. I’ve Got Peace Like a River I've got peace like a river, I've got peace like a river in my soul. I've got peace like a river, I've got peace like a river. Mazovia By Maciek Brazewicz. Mazovia This is map of the Mazovia and his herb. Capital of the Mazowia is Warsaw. Warsaw is the capital of Poland too. Knight. bright night fight In the middle of the bright night two knights had a fight. Comenius meeting n° 4. October 22nd -27th -2007 This Summary is about all the activities carried out for the project: “Do you play with me”, as requested.